Domenico Scarlatti's canon of 555 keyboard sonatas is one of the great collections of classical music, and one that we have already visited with the Scarlatti Society recordings of the 1930's by Wanda Landowska (PAKM004). In 1951 Fernando Valenti and the Westminster Recording Company of New York began work on an ambitious project, to record the entire set for the newly emergent long-playing record. Although the project ultimately ran to about two dozen records, alas it was never completed, with only about half of the sonatas making it onto LP. The first six of these LPs are being lovingly remastered from the original vinyl by Peter Harrison at disk2disc as a six-month series for Pristine Audio Direct to run from January to June, 2006. Here we present volume one, as originally released though with the newer Kirkpatrick numbering system also noted - Ralph Kirkpatrick had earlier encouraged Valenti to study the harpsichord, but at the time of this recording had yet to finish his complete listing of Domenico Scarlatti's music, which was to come with his critical edition of 1953. Of Valenti, his obituary in National Review noted: ""Valenti was to Scarlatti as Artur Schnabel was to Beethoven. Just as Schnabel was this century's greatest interpreter of Beethoven, so Valenti was our time's definitive exponent of Scarlatti." So said Thomas Wendel, professor of history, San Jose State. And Tom Wendel went on to say, on hearing that Fernando Valenti had died in a taxicab en route from Kennedy Airport to his sister's house in New Jersey, "Valenti's personality mirrored Scarlatti's music: humorous, versatile, mercurial, jocular; and at base, profound."" Valenti had achieved a number of 'firsts' by the time of this recording (made when still in his twenties) - the first harpsichordist to have recorded a film soundtrack, the first to have appeared on television and the first to appear in a Broadway show. Many critics feel that these first mono recordings for Westminster in the early 1950's are perhaps the best of his career, particularly the best of his Scarlatti. One cold Sunday afternoon in December, 1966, in St. Louis, Missouri , my wife and I went to a recital by Fernando Valenti of baroque harsichord music. 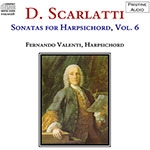 I was a fan of Valenti, because his electrifying performances of the Scarlatti sonatas issued on Westminster in the early 1950's convinced me that Scarlatti was a great composer and not just an exceedingly productive but repetitious tinkler. We went to pay our respects to Valenti at the intermission and found him in his dressing room alone, sweating and rather agitated. After congratulating him, I asked him if there was anything I could do for him. He said that he was starving and would give anything for a quick sandwich. We ran across the street to a deli and got him a big corned beef sandwich and a root beer. He started gobbling the sandwich and we left him to eat in peace. Hearing these performance again made me realize why I was so taken with him in college more than 50 years ago. While there are many great Scarlatti harpsichordists and pianists such as Landowska, Ralph Kirkpatrick, Horowitz, Michelangeli and Pletnyev, they all give us Scarlatti through the veil of baroque constraints. Valenti seems to rip that veil away and make it seem that he is improvising the music with no limits to the passion or expression. The repetitions seem to strengthen the power of the music. Some of the powerful impression of this recording must be laid at the steps of its magnificent reprocessing. The somewhat shrill 1950's sound has been silvered. The blasting bass has been tamed. What is left is dynamically very wide yet exceedingly mellow. Most importantly, the sonatas speak and grab hold and compel more than just aesthetic appreciation.